Winnebago Industries, the giant RV manufacturer based in Iowa, is heading out West for the first time and will soon begin building diesel vehicles at the former Country Coach plant in Junction City. The company expects to hire as many as 200 workers over the next 18 months. Winnebago’s plans come amid a revival in the RV industry. RV manufacturers shipped 356,700 vehicles to dealers nationwide last year, the highest total since 2006, according to the Recreational Vehicle Industry Association. In addition to using the 104,000-sf Country Coach headquarters at 135 E. First Ave., Winnebago also plans to use the 80,000-sf complex just across First Ave. from the headquarters. Winnebago Industries, Inc. is headquartered in Forest City, Iowa. The company was incorporated under the laws of the state of Iowa on Feb. 12, 1958, and adopted its present name on Feb. 28, 1961. The company builds quality motorhomes, travel trailers, fifth wheel products and transit buses. As of Aug. 30, 2014, the motorhome and towable dealer organization included approximately 274 dealer locations in the U.S. and 207 locations in Canada. In 1958, businessman John K. Hanson and others convinced a California company to open a travel trailer factory in Forest City, Iowa. After a rough start, the operation was purchased by five Forest City residents and John K. Hanson became president. To improve quality, Winnebago Industries manufactured furniture and other components designed specifically for its travel trailers. In 1963 a wall construction process called Thermo-Panel® was developed. It provides a strong, yet lightweight and well-insulated sidewall. Innovations such as these resulted in a dramatic increase in the company’s sales. 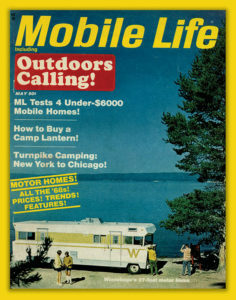 In 1966 the first motorhome rolled off the assembly lines. Thanks to the use of assembly lines and other manufacturing innovations in the motorhome industry, Winnebago could produce a motorhome that sold for half the price of competitors’ models. 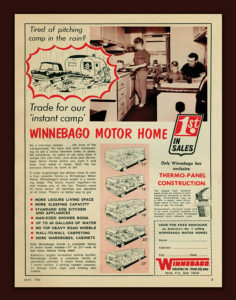 In 1970 Winnebago Industries moved to an expanded manufacturing facility and earned a listing on the New York Stock Exchange. 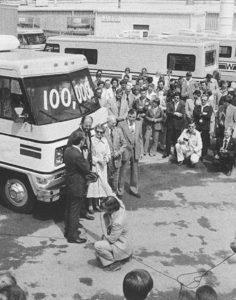 In 1977 Winnebago built its 100,000th unit – the first RV manufacturer to reach that production level. The company continued to grow. 1984 was the first time the company’s sales topped $400 million. 1986 saw Winnebago celebrate 20 years of motorhome production – the first RV manufacturer to reach that milestone, and the first to produce 200,000 motorhomes. 2004 was a banner year for the company with record revenues of $1.1 billion and motorhome production of approximately 12,500 units as the US economy peaked with low interest rates and high consumer confidence levels. In 2008, as the company celebrated its 50th anniversary, it reached another milestone with the production of its 400,000th unit. A new chapter opened when the company purchased SunnyBrook RV in December 2010, re-entering the towable manufacturing market for the first time since 1983. Much has changed since the first recreational vehicles were produced in the American heartland more than 50 years ago, but much also remains the same. The Winnebago Industries commitment to providing high quality, great value, efficient design and eye-catching style in recreation vehicles remains a driving force for the company. All of this adds up to more for you, the RV customer. And, after all, isn’t quality and value what you want? We plan to continue doing what it takes to make Winnebago Industries motorhomes and towable products the best overall values in the marketplace for many years to come. 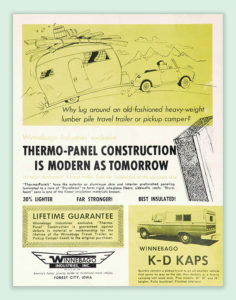 From the very beginning Winnebago and Itasca motorhomes have been built by some of the hardest-working, most dedicated employees anywhere. Many employees have been working at Winnebago for more than 30 years. The average is approximately 16 years! Some of our workers are following in the footsteps of parents and grandparents. Higher quality also is the result of testing. A 40,000-sf testing facility was completed in 1989. A computerized road simulator and a half-mile test track can simulate the effects of years of driving in just a few days. Components are checked under hot, cold, wet and dry conditions Every motorhome goes through a high-pressure water tunnel to check for leaks before shipping. By offering motorhome consumers the best possible products in a wide variety of models, Winnebago Industries continues to lead the motorhome industry and will continue in the future with steady growth; commitment to quality; extensive research and testing, and a fantastic lineup of RV products!